Pepin the Younger was born in the year 714 in what is now France. He was the son of Charles Martel, the Mayor of the Palace. As Mayor of the Palace, Martel ruled Francia (the kingdom of the Franks), but served the Merovingian kings. When Martel died in 741, he divided his seat as Mayor into two parts. Carloman, Martel's eldest son, became the Mayor of the Palace of Austrasia, or Eastern Francia. Pepin was crowned as the Mayor of the Palace of Neustria, or Western Francia. Grifo, Pepin and Carloman's half-brother, did not inherit a position, so he demanded that he got a piece of land from his two half-brothers. Pepin and Carloman refused and imprisoned Grifo in a monastery. In 743, Carloman and Pepin officially acknowledged the king, Childeric III, as the king of Francia, but for an unknown reason, Carloman retired as Mayor four years later to become a monk. This left Pepin as the Mayor of the Palace for all of Francia. In 747, the same year that Carloman retired, Grifo escaped his prison and started a revolt against Pepin, which was completely destroyed by 753, when Grifo was killed in battle.. In 752, Pepin asked the Pope to depose of Childeric III, the king of Francia. Childeric was king, though he had no power. All the power rested with Pepin, the Mayor of the Palace. Pope Zachary, needing help to fight against the Lombards, agreed to Pepin's request, and Childeric was deposed. 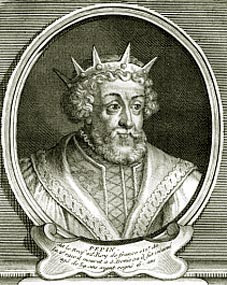 Pepin became the new king of Francia, starting the Carolingian dynasty. In 752, the archbishop of Mainz anointed Pepin, but in 754, Pope Stephen, Pope Zachary's successor, personally went to Paris to anoint Pepin as king. Along with anointing Pepin as the King of Francia, Stephen also gave Pepin the title of patricius Romanorum, or Patrician of Rome. In return for anointing him, Pepin helped Stephen to fight of the Lombards. When Pepin defeated them, he forced the Lombard king Aistulf to return the land belonging to the Church. Pepin also expanded Francia, attacking Septimania, a region in southern France, taking it over by 759. When Waifer, the duke of Aquitaine, seized church lands in760, Pepin went to war with Aquitaine as well. This was the harshest war under Pepin's rule and Pepin had to burn everything in his path to inspire fear in Waifer. By 768, a pro-Frankish treaty was accepted by the Aquitanian nobles. Pepin died in 768 at the age of 54. Pepin was interred in the church of Saint Denis. Pepin is in our book because he is almost always forgotten. His father, Charles Martel, and his son, Charlemagne, both earned more fame than Pepin even though it was Pepin that acquired the Frankish throne for the Carolingian dynasty. He also has the best description ever: The Short. Anybody who is called "The Short" is automatically awesome.